GRRRR! Yes- it happened again. I heard about a first time mama who was told (conveniently after her due date) that her fluid levels were low. Induction must happen- ASAP!!! Induction goes though, mama is lucky quite frankly to have a vaginal birth, and delivers (after much fuss and turmoil) a baby hardly over five pounds. First, lets establish a few things. "The volume of the amniotic fluid is evaluated by visually dividing the mother's abdomen into 4 quadrants. The largest vertical pocket of fluid is measured in centimeters. The total volume is calculated by multiplying this value by 4." via Medscape. "Oligohydramnios is sonographically defined as an AFI less than 7 cm or the absence of a fluid pocket 2-3 cm in depth." It is also stated that, "If the mother is in the third trimester and if the volume is less than 8 cm, suspect oligohydramnios. Levels less than 5 cm indicate significant oligohydramnios." I mention the actual level that is considered dangerous because I get the distinct impression that women are routinely told that their fluid levels are low, without actually being told WHAT the fluid level is or what is actually considered low, dangerous or normal for full term. One of the first things that we need to know as women is what really is considered safe and unsafe when it comes to our health and our babies. If we have no idea what is normal, it is just too easy for us to be freaked out when we need not be. Drinking water increases fluid levels. Here is an abstract from a study showing that drinking lots of water for a week can increase levels by a few points. So when your midwife/Dr/childbirth educator or whoever mentions that you should try to drink more water and stay hydrated to improve your fluid levels, they are not kidding. How we treat ourselves while pregnant can really have a big impact when we are trying to stay low risk. "The accurate assessment of amniotic fluid volume by ultrasonography can be influenced by an inexperienced operator, fetal position, the probability of a transient change, and the different ultrasound diagnostic criteria of an abnormal volume." So, the reading that you get, if done via ultrasound, can vary depending on the skill of who is doing the ultrasound OR transient changes (such as, you didn't drink enough water that day). Dr. Roger Harms on the Mayo Clinic website mentions that, " Amniotic fluid normally decreases in the last weeks of pregnancy." This is important because some decrease at the end of pregnancy is normal and is not dangerous. Oligohydramnios occurs in 4% of pregnancies, according to Medscape. This is in fact, a fairly rare condition. However, it is one of the big reasons we hear so often for "necessary" induction. Why is something that is in fact fairly rare so common?
" The amniotic fluid is constantly being produced and renewed – Baby swallows the fluid; it is passed through the gut into the baby’s circulation; then sent out through the placenta. This process continues even if the amniotic membranes have broken. So, even when the waters have ‘gone’ there is still some fluid present ie. there is no such thing as a ‘dry labour’." "Then we looked at the maternal demographics, we looked at the outcomes of the babies, and we found that the fluid measurements weren't very predictive of babies that later had problems."" My, my- could it be that the wonders of modern technology, when applied to childbirth, are sometimes wrong? Gloria Lemay wrote a beautiful post regarding the biophysical profile, its flaws, its misuse, and the beauty of good old fashioned, hands on midwifery care and fetal kick counts in assessing fetal normality. You can read it here. I have had four babies, two past 41 weeks, two with zero ultrasounds, none with full term biophysical profiles and they were all 100% healthy. Before moving on I want to mention that low fluid levels can in fact be very dangerous or indicative of a very serious problem. I am by no means recommending that women ignore the advice of their physician nor am I advocating that fluid levels don't matter. They do. What is disturbing here is that women are pretty routinely told that their fluid levels are low and necessitate an induction when that may or may not be the case. This is a fairly easy scape goat for induction/c-section. If your care provider wants to find a 'medical' reason to induce you, they will probably be able to whip one up. This is why choice of care provider is so incredibly important. Let's not convince ourselves that because we did X Y or Z (hired a doula, took a class, picked a pretty hospital, etc) that we will have a charmed birth with whoever happens to show up. Tread softly when it comes to choosing your care provider and hospital. Just a word for the medical community at large though: NEVER cry wolf. When you start telling women that they have a condition that they actually don't have or if you inflate minor risks or borderline test results into huge dangerous risks in order to make somebody birth at your convenience or on your schedule, women start to lose faith in you. Some will continue to believe everything you say. But many women will opt to stay away from hospitals, birth at home, birth unassisted, or opt out of tests simply out of fear that they will be lied to. Women should never ever in a million years have to wonder if their care provider is telling them the truth when it comes to the health of them or their baby. A person whose job it is to care for pregnant women and their babies and who is sworn to first do no harm, should never over inflate risk in order to make a patient more compliant nor to better be able to schedule their life. ~Fluid levels drop at the end of pregnancy. ~Drinking water can increase fluid levels. ~Truly low fluid levels are relatively rare (about 4%). 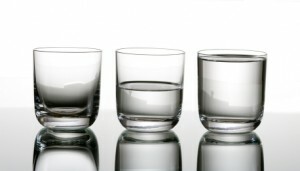 ~Even when fluid levels are low, they only result in poor outcome a fairly small amount of the time. ~The test that determines fluid levels is in and of itself not foolproof. ~Amniotic fluid can replenish itself, it isn't a closed system that once lost is gone forever. ~How you care for yourself in pregnancy matters. ~Who you choose to care for you during your pregnancy matters. ~It is imperative that YOU know what is normal, borderline, and dangerous when it comes to diagnoses during your pregnancy. ~It is also imperative that you take responsibility for the real risks and benefits of whatever course of action you choose. not a very wordy post, am I missing something? Thank you for this post! I've been getting weekly BPP's because I have type 2 diabetes. Though I trust my providers, it is good to know NUMBERS and what is ACTUALLY dangerous compared to just some general statement of "Your levels are low". Fabulous as always. And can I make a request? Please write an Obstetric Lies entry about a woman's pelvis being too small to birth vaginally. Someone I know just recently went to the hospital in early labor, got put on pitocin, baby was in distress. Instead of saying, "OH SORRY, our augmentations have made it necessary for you to have a C-section" her OB said, "Your pelvic arch is too small to birth a baby vaginally." She had a baby that was 6 pounds. I burn with rage every time I think about this. I was one of the 4% that had real low fluid levels. BUT it was found at my 20 week ultrasound. I had less an 1cm of fluid. This was caused because my baby had cysts in both kidneys and was not producing fluid. It was a fatal condition called Bilatreal Multicystic Dysplastic kidney Disease. in my research if you have low fluid in the 2nd trimester it is normally caused by the baby. If you have low fluid in the 3rd trimester is is normally something to do with the mother. I will do that Linda! Thanks for the idea! Awesome post - it made me wonder - have you written a post about going past one's EDD? And i completely agree with you :) I just wanted to share my experience that is *can* happen, and it was serious, but it was found out WELL before my due date. I agree 100% though that it is sad that these days a women has to step back and decide if her provider is telling the complete truth about something. What happened to their 'do no harm first'? I was in fetal testing for a BPP at 40 weeks 4 days... baby looked great, but they couldn't get an accurate reading on his AFI (DS wound up being a big baby). They told me I had 4cm of fluid. I thought it was odd because I had had no leaking of fluid whatsoever and my AFI was fine only a few days before in the doctor's office when she did a quick scan. I was IMMEDIATELY escorted to L+D for induction. I was not allowed to go home first to shower or pick up my hospital bag. I was so upset about this whole situation and when I asked if I could sign out AMA, I was told my insurance wouldn't cover the birth and I'd have to pay out of pocket (we were poor college students on medicaid at the time). I HATED being manipulated like this. I was told "If you go home, and if anything happens to the baby, it will be your fault and you'll always blame yourself. You don't want that, do you?" UGH!!!! So... i let them induce me.... 8 hours of active, painful, labor and then 3 hours of pushing... and then I had an emergency c-section for fetal distress. Follow that up with PTSD and PPD. Did I mention that when my water broke, the midwife told me I was "like Niagara Falls!" I had SOOOO much fluid. So much in fact, that it seemed to be the same amount that I had with my VBAC daughter, with whom I was diagnosed as having POLYhydramnios. Go figure! Sonograms aren't that accurate afterall! @kellymseow- i went 12 days past my 'due' date, 100% natural delivery, my son was perfect, there was a little meconium in his fluid but he didnt even need to be suctioned or have oxygen. I was NOT going to be induced. The thought of it scares me to this day.I did my research and found out a lot of 1st babies go to or past 42 weeks, and there are many countries where it is normal and there are no high rates of problems or anything to suggest it may be unsafe. sorry about the loss of your birth and I hope you feel good these days and can trust completely in your body now. It is a lie that insurance won't cover AMA. There are very specific circumstances that it applies. Tell them to shove it next time. I have some other bits of advice about how to handle rose medical bills too... if they continue to manipulate and lie to women, they deserve to be stiffed. Imo. I went in for a late ultrasound to check fluid levels, and my midwife told me to drink drink drink beforehand. She said if I was truly having a problem, then I couldn't drink my way out of it. But if it was just a matter of my own hydration, problem solved! I also increased my fluid intake before any ultrasound -- I had several because my fundal height was measuring small. Thank you. This is really important work. Thanks for this post! With my first child at around 32 weeks we went in for an elective 3D ultrasound and found out he was breech and my fluid levels were on the low side (8 cm). I was monitored regularly and despite upping my water intake they eventually dropped to just under 5 cm at 37 weeks. Because my little guy was breech and because of the believed low fluid I didn't attempt a version to turn him and wound up having an scheduled c-section. I still wonder to this day whether my fluid levels were actually low or whether my baby's frank breech position just prevented the sonographer from seeing the fluid pockets. I'm now 34 weeks with my second and she is head down and my fluid levels are at 16 cm. Trying for a VBAC this time around. Ultrasound can be a huge risk. Thank you very Steady info ... hopefully more successful.